This Phazer is Set to Stun! The Great Planes Phazer is a stylish looking delta winged electric ducted fan (EDF) powered model that flies at a maximum speed of around 90mph. 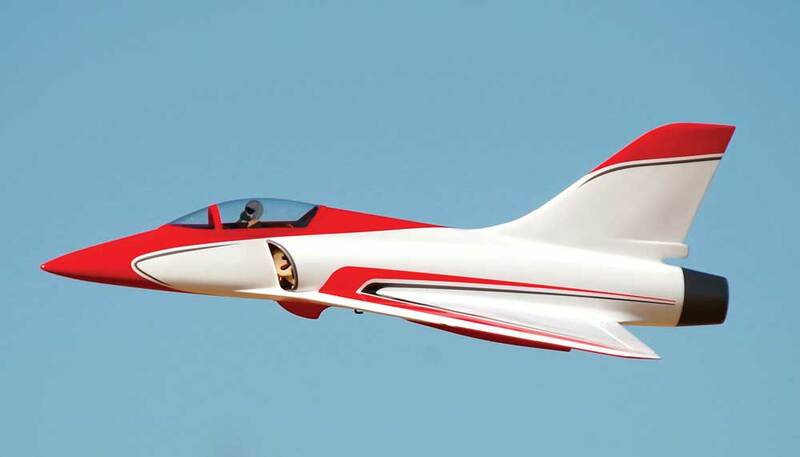 It features a one-piece, composite construction (fiberglass) fuselage and vertical stabilizer. The small triangular wings are constructed of balsa and light ply and are joined through the fuselage using an aluminum joiner tube. The fuselage glasswork is adorned in super glossy paint that is laid on thick and smooth, while the wings are covered in color matched MonoKote film. Great Planes includes the entire electric ducted fan power system in the box. This proven ElectriFly 56mm Hyperflow fan, when mated to the ElectriFly Ammo 3790Kv brushless inrunner motor and fed by a quality 30C LiPo battery, is good for around 450 to 475 watts. Items required to complete the kit include a pair of three inch servo extensions, a 4S 2200mAh LiPo battery, a 35 amp speed controller, a pair of micro servos (minimum of 20 ounces of torque recommended) and your favorite radio system (minimum four channel). The lack of a working rudder, coupled with the elevon configuration inherent to a delta winged aircraft, makes for relatively quick assembly. Great Planes provides a basic, but effective light ply center of gravity device and plywood indexing tabs that can be temporarily mounted to the wings. These bits and pieces of wood together serve as invaluable tools that can be used to ensure that the CG is exactly where it needs to be. Assembly is completed using a variety of different adhesives, but care must be used lest they find their way into any of the moving parts of the Hyperflow fan unit. The assembly manual is notably thorough. Close adherence to its detailed assembly instructions and recommended setup parameters will stack the odds of a successful maiden flight in your favor. The Phazer is not equipped with landing gear of any sort, mandating that all flights start out with either a hand launch or a catapult style launch using the included bungee system. The latter method is so easy and fool proof that I question why anyone would tempt fate by using the inherently riskier former method! 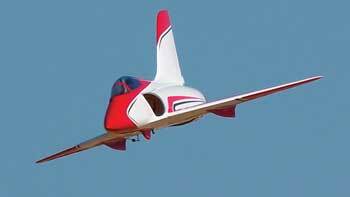 The Great Planes Phazer is a nicely engineered, compact sport EDF powered jet. The assembly manual and completion guide is thorough and well thought out. I was so impressed by the quality of the fiberglass fuselage and how closely it’s red, gray and white paints matched the MonoKote covered wings that I decided to limit the graphics to just one tasteful “Phazer” logo per side. The included bungee style launcher gets the Phazer aloft and on step in an instant and minimizes any chance of damage due to less than perfect hand launches. WING AREA: 224 sq. in. FLYING WEIGHT: 1 lb, 14 oz. > The Phazer’s lines are curvy and crisp, from any angle. > The glasswork is first rate, the paint deep and glossy. > Botched hand launches are all, but eliminated by using the included bungee launcher. > The wing’s delta configuration simplifies and speeds the construction. > Satisfyingly fast, especially when screaming by a few feet away and on the deck. The Great Planes Phazer features a trio of landing skids that are glued to the underside of the model during assembly. The aircraft will thus probably fare best at grass equipped flying fields. Paved flying sites will not only make it a difficult to anchor one end of the bungee launcher, but will, after repeated landings, eat away at the plastic landing skids. California is known as the Golden State because the majority of the vegetation is completely brown by summer’s end. My maiden flights took place on a flying field full of dry, scratchy grass and weeds. Getting the bungee stake securely anchored in the arid ground was a challenge that was only overcome using an improvisational hammer (read as BIG rock). I found myself feeling a little jittery about the maiden to come, in spite of the fact that my flying partner had just successfully maidened HIS Phazer. Though I had followed all of the instructions to the “T” and adhered to the setup information to the last fraction of an inch, the small voice of doubt was still whispering sweet “what ifs” in my ear. I decided it best to have my partner handle the bungee launch, freeing both of my hands for the transmitter sticks on this shakedown flight. Great Planes includes a pair of adhesive backed, sandpaper-like rectangles that that can be affixed to the sides of the fuselage. When applied, they serve as a way of providing a no-slip grip for holding the Phazer fuselage in one’s hand when launching it. Even though I have smallish hands and my partner sweats a lot, we had both decided to leave these grips off. Neither of us liked the way that they would interrupt the nicely flowing lines of the fuselage. Medium to large hands that are sweat free will have no problem comfortably gripping the Phazer fuselage, even without the grip pads in place. With my Phazer at about 30 paces worth of tension on the bungee launcher, I gave the thumbs up to my partner and ran the throttle up to around 65 to 75-percent. A quick tip of my head and he released the Phazer. It rocketed forward and cleared the bungee in one point zero seconds flat. My initial thoughts were that something seemed “off” and that I was due for a wild ride, but a few clicks of right trim and a little more throttle had the Phazer trimmed out and nicely on step. Those pre-maiden jitters sure can knock you off of your A game! Delta wing configured aircraft are known to drop their noses in turns, especially if the turns are excessively steep or you allow the model to bleed too much speed. A forward CG can make this tendency even more pronounced. With this thought in mind, I kept the throttle pushed forward and confined myself to flying the Phazer in large, sweeping ovals and figure eight patterns until I became a little more comfortable with it. I had set a count down timer at a very conservative three minutes for the first flight. Just as my heart rate was returning to a more normal rhythm, it was time to bring her in for refueling. I set up the landing approach with a nice descending turn to final and held a little power until over the landing zone. My first landing was easy and uneventful. The delta wing allows the Phazer to slow nicely and landing flares result in a nice, nose high orientation. Given the large air inlet orifice on the bottom of the fuselage, post landing protocol should always include an examination of the fan for any foreign object damage or entry. I also thought it best to inspect the aileron linkages to insure that they were still secure. The FlightPower LiPo took 1700mAh back on the recharge cycle, telling me that it would probably be safe to push my timer up an additional minute or so on the next flights. With the maiden monkey off my back, I was able to relax a little and focus on exploring just what the Phazer was capable of doing on subsequent flights. The roll rate is plenty fast, especially if you are flying on the recommended high rate throws. Inverted flight is stable and requires, but a small amount of down elevator. Keep the turns on the shallow side when inverted or you will need to feather in even more down elevator to keep the nose from falling. Though the Phazers lack of a rudder negates the always cool knife edge pass, a pseudo knife edge orientation can be achieved by going to wide-open-throttle, pitching the nose up slightly and then rolling the Phazer onto its side. It will hold the knife edge all the way down the runway, mainly due to the fact that it can cover the length of a football field in just over two seconds when flown at WOT! Bungee launching this jet is the way to go. Though the assembly manual does suggest hand launching as a viable alternative, the catapult method works too well for me to even risk going there. If you have a friend with a major league arm who can guarantee that he will release the Phazer with the wings level, it is probably worth exploring the hand launch method. The Phazer is in a vulnerable position during the first few seconds of flight after a hand launch. It takes it a few seconds to accelerate to the same speed with which it comes off the bungee line. During this period, the shortage of airflow over the control surfaces renders them somewhat ineffective. Release the model in a wings level orientation, with the nose pitched slightly above the horizon, and all that is required is to hang on while the model builds speed and gets on step. If the Phazer comes out of the launcher’s hand wrong, you may not have enough time and/or control authority to make it right. I love EDF powered jet models and I love going fast. I am not sure what it is about delta winged aircraft like the Great Planes Phazer, but they have always managed an extra special spot in my heart and hangar. There is something inexplicably intriguing about the geometry inherent to a simple triangular wing that catches my eye. 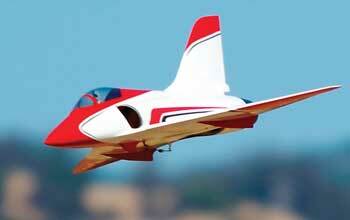 The composite fuselage features good quality fiberglass layup. The paint applied over it is deep and glossy. The 56mm Hyperflow fan makes an abundance of power and runs smoothly once it is balanced and run in properly. There is almost nothing worse than “rekitting” a model due to a goofed hand launch. The bungee launcher included in the box makes for almost fool proof launches. Great Planes provides all of the necessary assembly and completion details and tools to ensure that the maiden flight is a successful one. Though the model can be assembled quickly, extra time spent getting all of the little details right pays off in an exhilaratingly fast EDF jet that looks oh-so-fine from any angle and flies wonderfully. Next 1st U.S. R/C Flight School trains its 1600th student! Here’s his report….